Challenge has been fortunate enough to have the support of the Essendon Football Club for a number of years with player visits to the hospital and the annual ‘Clash for Cancer’ round. This Sunday, 22 Challenge kids will have the chance to run out onto Etihad Stadium, hand in hand with one of their Essendon idols. In the lead up to this special experience, the players wanted to connect with the kids before running out with them on game day, so invited them to attend a training session. You couldn’t wipe the grins off the kids’ faces as the Essendon players finished training and made their way to meet the group. The new centre has some amazing facilities and to be able to have fun on the indoor oval and have a kick with the team was something the families will never forget. It was incredible to see the utter joy on not only the kid’s faces, but also the parents who couldn’t be happier to see their children in an environment that is so distant and separate from cancer and treatment. The Essendon FC should be proud of their contribution to the lives of kids living with cancer, as the impact this event has is significant. 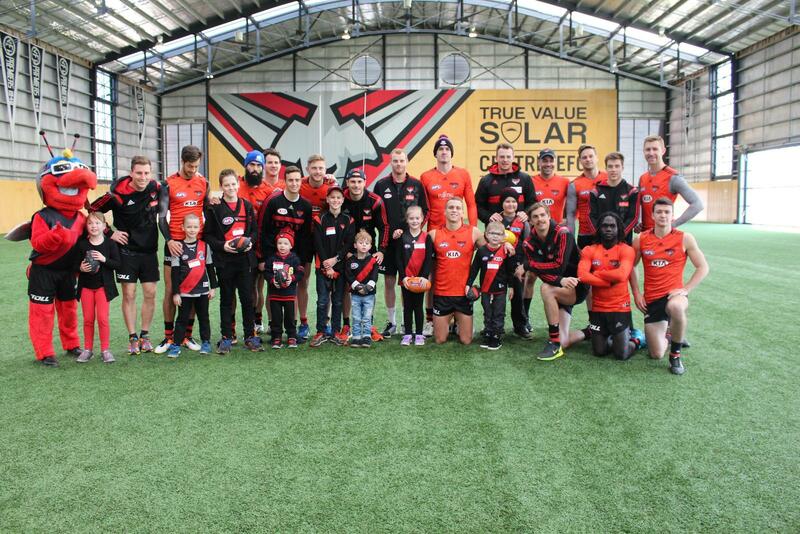 Challenge would like to thank everyone at the Essendon FC for making this opportunity possible. To Brendan Goddard, the skipper of Essendon, thank you for getting the boys together and making this an extremely special moment for our families. Thanks also to Maddison for the tour and for making us feel so welcome. The team at Challenge cannot wait to run out with the Essendon team on Sunday….only four sleeps to go!